For more than a quarter century, the U.S. Government Accountability Office has been highlighting and tracking a handful of programs that it judges as being at high risk for waste, fraud, abuse, and mismanagement. That list has grown from 14 programs in 1990 to 32 by 2015, when it was last updated. These programs range from Medicare benefits to food safety oversight. The report also describes instances where some agency leaders actively sought to have their programs placed on the list – and explains why. Read the article in Federal Times. 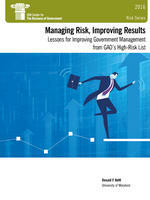 Read the article in Government Executive. Read an article in Government Executive about a roundtable held by the Homeland Security and Governmental Affairs Committee on this issue.